Senbei - a snack known to each and every person in Japan. Let's look at some of the basics of these Japanese snacks. Senbei (煎餅) are baked or fried rice crackers made with dough from crushed non-sticky rice. With a distinct crunchy texture, these savory treats are also known as beika senbei. Not all senbei is made with rice flour; some are made with regular grain flour, such as the nambu senbei found in both Aomori and Iwate prefectures, as well as other regional variations on this snack. The first recorded instance of the word 'senbei' was dated to around the year 737. According to the text, the senbei in question was made not from rice but from grain flour that had been hardened in oil. The crispy rice crackers made with rice that are so familiar nowadays are believed to have originated in what is now called Sōka city in Saitama prefecture. Though crackers made from rice flour that had been shaped into a circle, then hardened and dehydrated had been made in the home, this was the first place to offer these preserved foods for sale. However, there are other theories as to the origin of senbei. Rice-based senbei tend to come in one of two large categories: baked senbei and fried senbei. Baked senbei include simple salted senbei, soy sauce flavored senbei, chili pepper senbei as well as sarame senbei, which has a thick coating of granulated sugar on it. These crunchy crackers with simple flavors make it easy to taste the ingredients that went into making them. 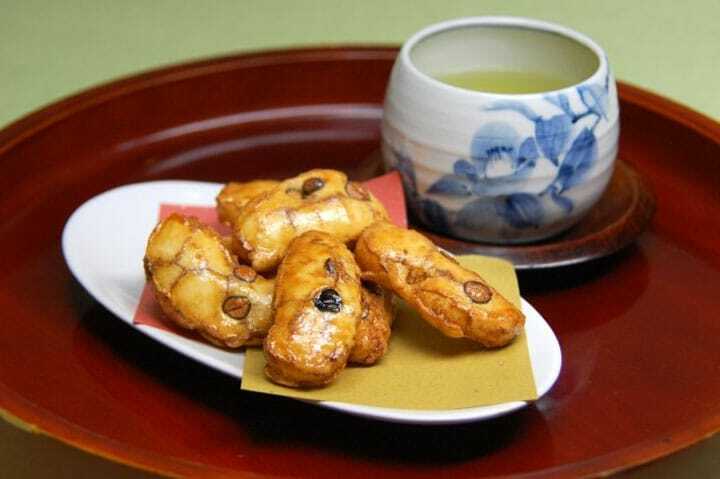 Fried senbei are often made by the combination of soy sauce and sugar, giving them a slightly sweet taste, and are best known by the names bonchi-age or kabuki-age among others. As senbei originally start out as rice, there are many ingredients that go deliciously with senbei. As a result, almost everywhere in Japan there is an original regional variation of senbei, which are sold as souvenirs. For example, Osaka with its famous okonomiyaki sells okonomiyaki sauce-flavored senbei, Hokkaido and its plentiful cornfields offer sweetcorn-flavored senbei, while Fukuoka has its own specialty - mentaiko-flavored (*1) senbei. There are chocolate-coated senbei and even nattō senbei. Senbei can be purchased at any supermarket or convenience store all across Japan. They are very reasonably priced and, upon arriving in Japan, make great souvenirs of everywhere you visit in this country. (*1) Mentaiko (明太子)... walleye pollack roe that has been salted and spiced with red pepper. If you want to know even more about senbei, why not try visiting their sales-birthplace, Sōka? In Sōka city, Saitama prefecture at the Yamako Senbei Factory, you can watch as senbei are made and try your hand at making your very own senbei! Making your very own senbei would be a particularly exciting memory of your time in Japan, as they are something that can't be found overseas. Please give it a try! Make Rice Crackers At Yamako Senbei’s Sōka Senbei Garden In Saitama! 5 Places To Find True Japanese Culture & Great Memories!